The southern section of Bruges was my favorite part. While I loved the bustle and rich decor of the Center Market and Burg, the south was more pleasant, peaceful, and historic. Being more out of the way from tourists was to its advantage, but it was not so far away that visitors couldn't get there if they really wanted to. This chapter begins with a loop from the Center Market down to the Minnewater and back, then concludes with the walk along the city wall leading south to southwest. The first area I passed was called Westmeers, running from the city's main bus station to the Minnewater. This road also happened to contain the hotel where I stayed. Westmeers featured a long facade of gabled red brick buildings hoisting colored flags, much like scenes commonly found in Leuven. There was a Catholic church there where I would attend Mass on that weekend. Since the area was predominantly Protestant and Catholic services were small, the priest who spoke five languages was able to survey the congregation and offer a servi ce tailored to it. It was a unique experience. The first major sight is shown in the first photograph, the 'Minnewater' or 'Lake of Love'. This was Bruges' original inner harbor which I believed was no longer in use, leaving the area very quiet and, according to the name, romantic. Indeed, one of my personal all-time favorite photos was taken from the opposite vantage point with a couple of children looking out over the lake. The Minnewater was formed into a rectangle and protected from flooding by dams beyond the inner city to the south. Sidewalks and vistas surrounded the lake on nearly all sides. I do not know what the building on the right side of the photograph was, however I do know that the building cut in half at the left edge of the photo was called the Old Waterhouse. Also, that was where one could readily hire a horse carriage for a ride. On this very sunny and warm day, the horse carriages were incredibly busy going back and forth from the Minnewater to the Central Market. Nearby was the Minnewaterpark, a small grassy park that contained a small old-style brick chapel (maybe you could squeeze twenty people into it max), and some old-style residential roads such as the Arsenalstraat. This street provided a good look at old-style housing -- with large low windows, row houses that curved right along with the street, and front doors that probably indicated how short people of Bruges might have been a couple centuries ago. The Minnewater was connected to a canal that ran northward past the Walplein region (more on that below) toward the Center Market. Canal boats filled with tourists passed by routinely. 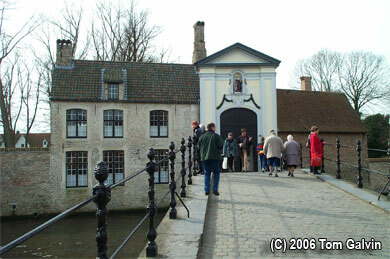 Meanwhile, I headed northward, reaching the bridge shown in the second photograph that led to the Beguinage. Built as a protected compound with Bruges' old city, the Beguinage served two modern-day purposes. It was a convent that had been active since the 13th Century, although the order has changed over time (it is now Benedictine). It was also an open-air gathering point large enough to host concerts in the summertime. 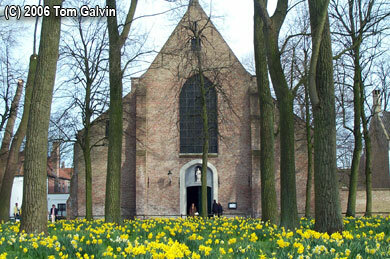 The third photograph shows the Beguinage's main chapel, one of the simplest of churches that I found within Bruges. Although this photograph was taken in very early March, the presence of so many spring flowers in full bloom indicates how mild the weather was that year. Behind me were the dorms, very simple bright white buildings that appeared recently repainted. The fourth and fifth photographs show some of the grand old monuments of the city's defenses. The ground where the city wall once stood has been replaced by green grass and a pleasant walking path, while the original moat now is just another canal leading to the city. 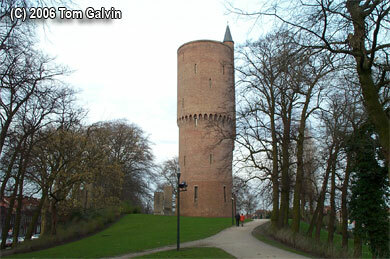 The fourth photograph shows a very tall watchtower near the Katelijnpoort at the southern end. I went further east to the Geentport (which I presume to mean the 'tower facing toward Ghent' but I could be wrong) that was directly on the moat. A small two-lane car bridge now crosses over the canal the way an old wooden drawbridge probably would have long ago. 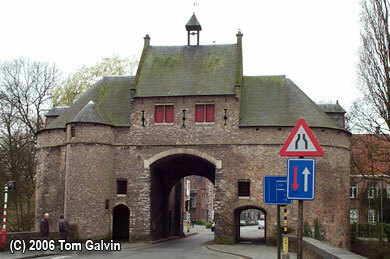 The fifth photograph shows the Smeedenpoort on the city's west, now just a one-lane entrance to the city. It too provides passage over the canal. Nearby was a large stone monument to a Belgian World War I hero named Leger. 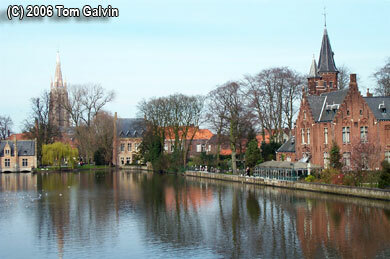 As you can see from the photographs, the southern part of Bruges has been cleaned up but was not dressed up. It was still basic red-brick architecture, as opposed to the elaborate Central Market district. The contrast was welcome, particularly as it gave me a greater chance to check out more of the historic and local treasures of the city. Trip Taken 16-17 March 2002 -- Last Updated 01 September 2006 -- (C) 2002,2006 Tom Galvin. The Bruges City Homepage used for fact checking in 2006.